Entering an industry can be difficult, regardless if you’re a fresh graduate or if you’re switching careers. One factor that could help ease the process could be having the right connections. But what if you don’t know anyone? Where do you start? 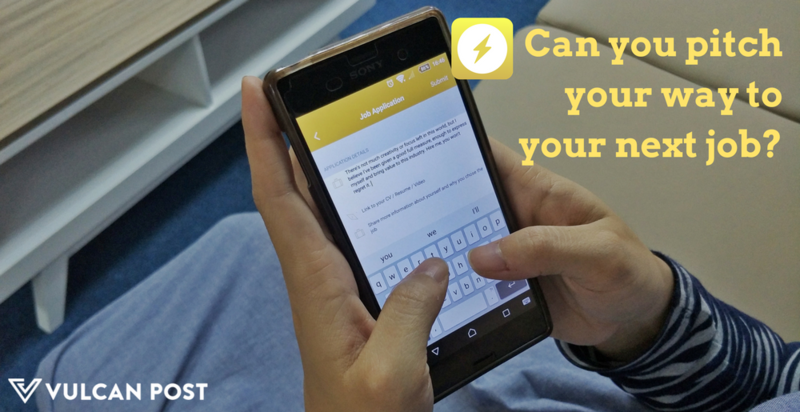 How much time will you need to spend filling out forms and customised cover letters? On the employer side, what happens if you want a lot of high quality candidates and you want them fast? 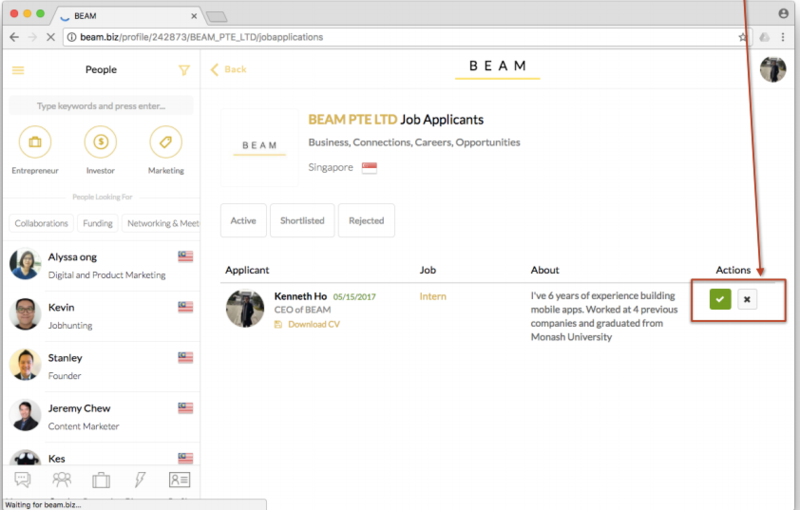 These were some of the issues that Kenneth Ho and his team reflected on before they decided to expand the BEAM platform to include Careers and Jobs. As a job application platform, their main focus is to connect the local pool of startups and SMEs to Southeast Asia, New Zealand and Japan, countries where BEAM already has a presence. This means candidates can easily apply cross-borders, as long as they’re eligible for the relevant work visas. BEAM has already been working to establish itself as a platform where entrepreneurs can have access to the right connections, capital, consultancy, coverage, and more. 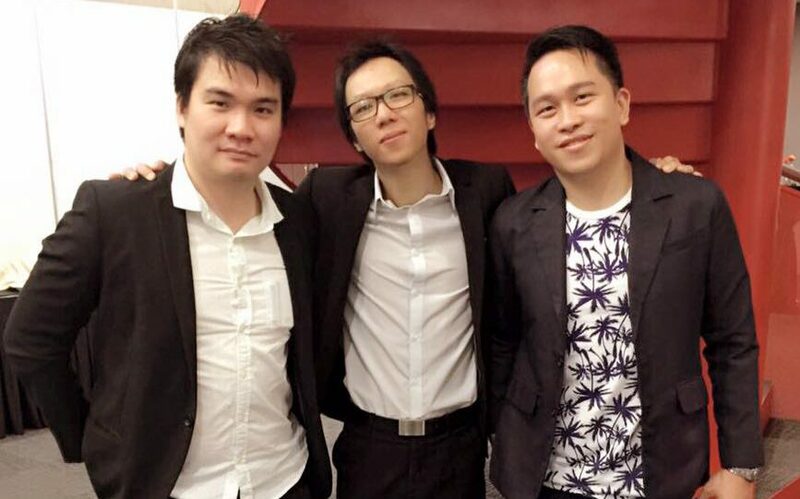 How they do it is multifold, both through the platform itself and also by organising events. To simplify the online hiring process and eliminate the need to go through long email correspondences and countless forms. 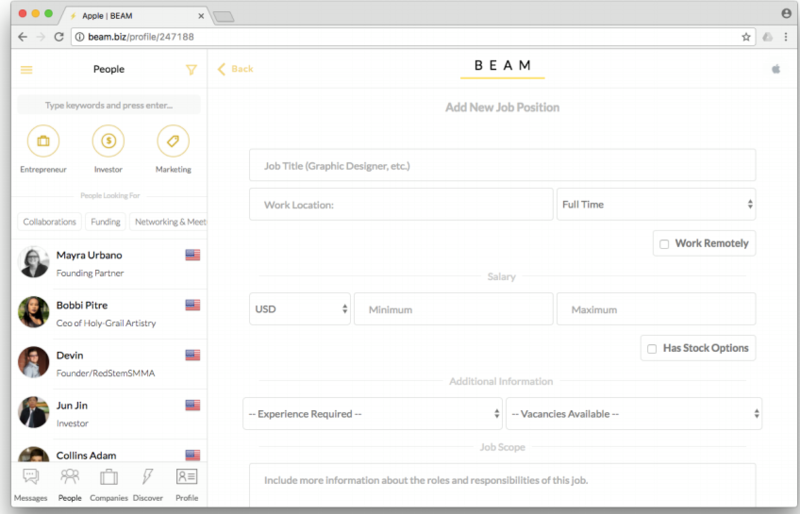 To help fellow BEAM partners in their hiring process. To identify both local and foreign talent that could contribute to the respective local startup ecosystems that may not have had the opportunity to go out there before this. On the BEAM website, the Careers And Jobs section can be accessed through the dropdown menu on the top left of the usual interface or via direct link. 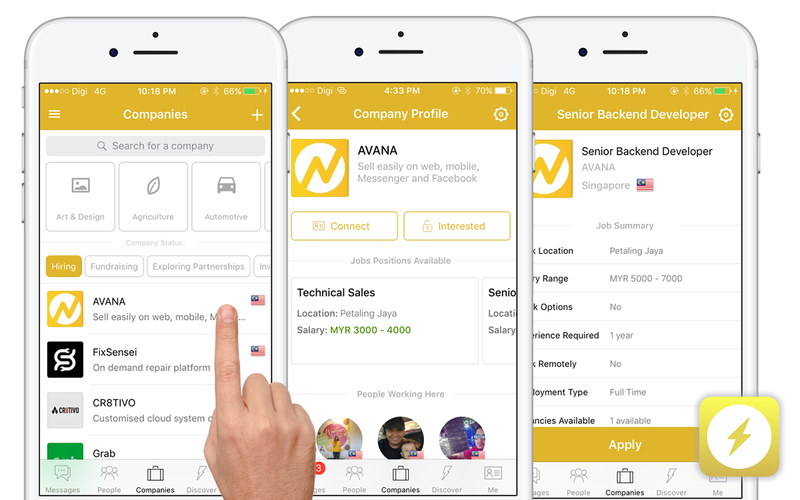 On the app, users can navigate to the “Companies” tab and select “Hiring” as an option to see which companies have positions available. Completing their profile allows candidates to access other features like creating company profiles, chatting, creating events, and more. This also helps BEAM to weed out any spam accounts. Adopting similar pitching processes of startup companies to investors like that British TV show Dragons’ Den, there are three fields for candidates to fill up when applying: an elevator pitch, a link to a CV or a video and any other additional information. An elevator pitch is basically a quick overview or a speech that is a persuasive outlining and idea of a product—in this case, the applicant. In BEAM Careers, that is the only field that must be filled in, and you only get 140 characters to do so, for now. A 72-hour limit for companies to respond. This means that candidates will know within 3 days if their application is successful or not, via an email or a notification on their mobile, if they have an app. If the company does not respond within the 72-hour time frame, the candidate will be notified automatically to find other positions. When a new job position has been submitted, it’ll be visible on the company profile. While encouraged to motivate transparency between job seekers and employers, disclosing the salary is optional. At the moment, new job listings can only be made through the website, not via the app, though there are plans to make this feature available soon. There is a limit on job applications (10 per candidate) to ensure quality for employers. This is because many candidates just apply for jobs everywhere, which serves as a problem for employers when they have already found a position. Potentially, employers can hire very fast thanks to less forms, simple job posting and the elevator-pitch format. Kenneth maintained that while it is too early to tell, they might monetise off advertising in the future or also aid in services surrounding recruitment. With BEAM Careers operating in various countries, it could contribute to creating a borderless working culture, which BEAM hopes to support. As for the short term, their goal is to get the jobs and careers section of their platform fully up and running, particularly in-app. 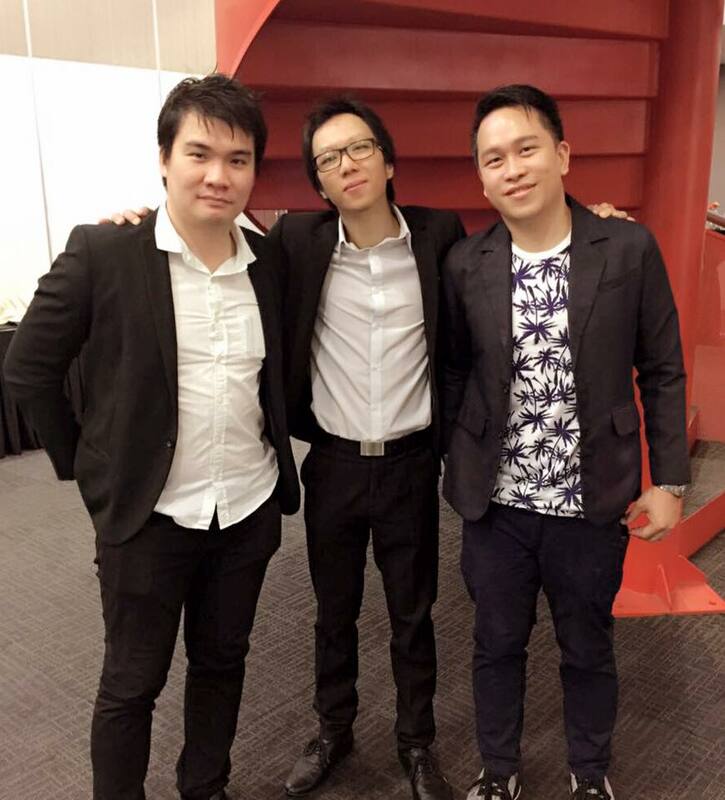 “There are great talents everywhere and we hope to bridge the gap between them and employers. As employers ourselves, we don’t want to spend hours filtering people and downloading long attachments and corresponding via email. There’s got to be a faster way to do this,” said the team and they are on their way to doing just that. The platform’s strength as a job application portal lies mainly in its current user base, which already consist of players in the SME and startup world. Naturally, most of the jobs that are on offer would be from this user pool of entrepreneurs, at least at the start. For anyone who is interested in getting their foot in the door of our ecosystem, this could be one of the places to look into. BEAM Jobs And Careers can be accessed here, or through the app on the Google Play Store or the Apple App Store.